Difference between passport book and passport card can be a new subject to you if you are not a citizen of the United States of America. Passport book and Passport card are two terms that are often used these days by many citizens of the United States who are applying for a passport for the first time. One of the most important differences between the two is that passport book has been in use for longer time than the passport card. 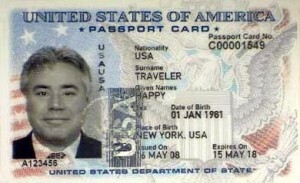 In fact, it can be said that passport card has begun to be issued only from July 2008. It is amazing to note that more than two million passport cards were already issued to the U.S. citizens by 2010. Passport book is what is known as a normal passport in other countries. A passport book has unlimited travel as far as the nature of the travel is concerned. That is, a passport book allows the owner to travel via air, land, or sea in an international basis. When it comes to the size, passport book is 5″ x 3 ½” (when closed). As a result, it is not easy to fit a passport book into a wallet. In fact, you need to have a hand bag to place your passport book. If you are an adult, you would have to pay $135 (2014) to get a passport book. If you are a minor under 16 years, you have to pay $105 (2014). You may renew the passport book for $110 (2014). You will have to submit evidence of U.S. citizenship, proof of identity and two recent photographs along with a copy of the identification while you apply for passport book when you are submitting the form pertaining to the acquisition of passport book. On the other hand, passport card is limited to land and sea travel only from Mexico, Canada, Caribbean, and Bermuda to the United States. Passengers who travel by air cannot use the passport card for that matter. Passport card is wallet size. As a result, a passport card easily fits into your personal wallet. It is something similar to a credit card in size. If you are an adult, it is enough if you pay $55 (2014) to get a passport card. If you are a minor under 16 years, you have to pay $ 40 (2014). You can renew passport card for only $30 (2014). As far as the validity of the document is concerned it is interesting to note that a passport card is as valid as a passport book. You will have to submit evidence of U.S. citizenship, proof of identity and two recent photographs along with a copy of the identification while you apply for passport card. The time taken to process the applications meant for both passport card and passport book is almost the same. However, in the case of passport card, it may take an extra week or two if there are a few complications. What is the difference between Passport Book and Passport Card? • Passport book has been in use for a longer period than the passport card. • Both types, passport books and passport cards, exist in the United States of America. • Passport card has limited travel opportunity. It is valid only to land and sea travel when entering the United States from Canada, Mexico, the Caribbean, and Bermuda. It is not valid for international air travel. • Passport book is valid for air, land and sea travel. • Both of them differ in terms of their size too. The passport card is smaller when compared to the size of passport book. • The fee to obtain a passport card and passport book also changes. Passport card: adult – $ 55; minor – $40. Passport book: adult – $ 135; minor – $ 105. • You may renew the passport book for $110 whereas you can renew passport card for only $30.